GWJ - The Pioneers is now running and available for connections. We also have chat connectivity between the Minecraft world and our Discord #moddedminecraft channel. Feel free to chat with us there if you're not in the game. Additionally, we have a voice channel set up on Discord, if anyone wants to participate. If you haven't connected to a GWJ Minecraft world before, please post or PM Merphle your Minecraft name (not email address) so I can get you added to the whitelist. Welcome everyone! I am splitting this thread off from the Minecraft Multiplayer: GWJ World thread. If you are looking for our vanilla server please follow that link. The mod pack we are running is Minecraft Unabridged ver 12. You can find the mod list for it here. To join, use mc.timelesslane.com as the "IP" address. Whitelist access only. If you had access on the vanilla minecraft server you already have access here. Once downloaded run the launcher in its own folder. Go to the Accounts tab on the right side and login with your Minecraft account. Once you are logged in go to the packs tab and press the "Add Pack" button in the top left corner and type "unabridged" in the Pack Code window and click save. Click "New Instance" and then "Install" A list of mods will come up. 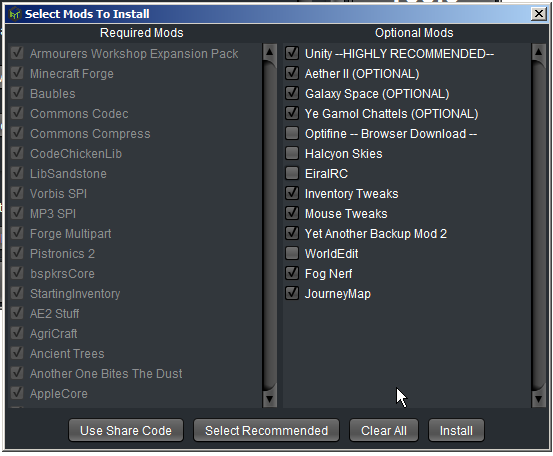 Click Select Recommended to get the default optional mods. Then unselect EiraIRC to removed IRC chat. 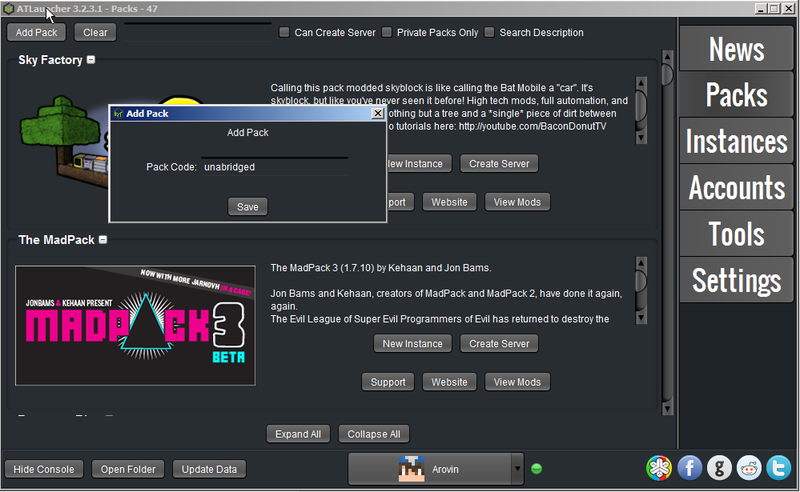 Once selected clink install and it will start downloading the pack. I would like to start a fresh Infinity Evolved Expert Skyblock map on this coming Friday, April 8th starting at 7:30 PM PST. 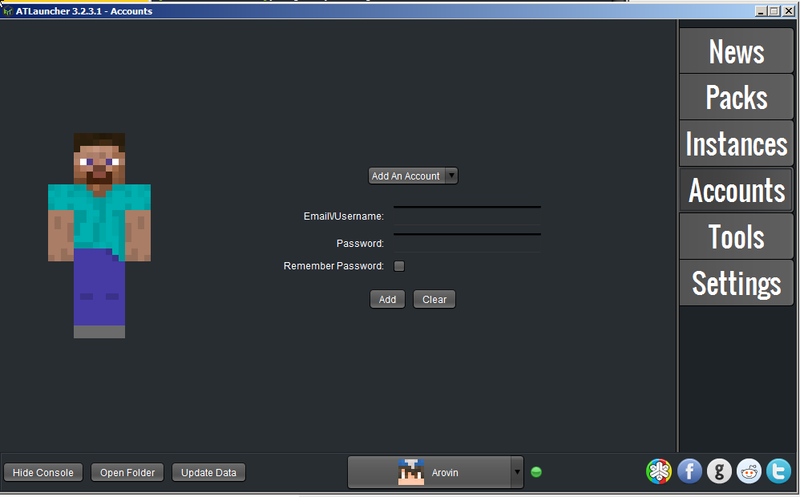 We have a teamspeak server and a web map set up. I will be recording this map as a YouTube series, and I believe Oddrune will be streaming. Who else would like to be on this map? Who wants to connect to teamspeak and will be fine being recorded / streamed? The plan is for this to be a cooperative playthrough, and get to where we can make the creative energy cell, creative tank and creative mana pool. Oddrune has come up with an overall design for the base that a few of us have looked at. It looks like a huge death ray. Those of you that want to be involved with this server, let's make sure everyone can log in and everything before the official start time next Friday. The server is using a Whitelist, so please let me know that you want to be whitelisted. You need to use the current feed-the-beast launcher which can be downloaded for PC from here or Mac from here. Asterith and Feegle, if you ping me on Steam, Twitch or Discord next time you're on, I'll try to get you squared away. Yes, I'm going to put you into a box and then use a hydraulic press to squash you into the right shape. I guess technically that's cubed away, but that just doesn't have the same ring. Feegle_Pyrate: I also died at the hands of a horde of skeleton riders and now I can't get the Chisel or Sorcery books back. I was just going to help you get your books back. Oh sorry, I forgot that's what was posted. I was on so I took care of the nasty skeleton riders. Ah! My confusion, because Asterith helped me and I got my stuff back already, but that wasn't likely clear or reflected in the chat logs. I wasn't sure if you were offering to resource dump and help me get started with my build (which, while welcome, is unnecessary; I love carving space out of the wilderness for myself.) At any rate, I appreciate the offer of aid. Not so much the threat of involuntary compression. Any interest in starting up a new pack to replace MS3D, which seems to have gone pretty quiet? I was looking at Bounds as a potential option with a not-overly-weighty mod list. My biggest concern would be the "find new structures to loot" aspect. With a multiplayer, persistent world the slower players would be disadvantaged as the structures closest to spawn got visited and cleared out. That's a fair concern (though I think we all tend to spread out a bit from spawn anyway when we play). How about another pack instead? I know how much you all love killing the Ender Dragon. What would you say to killing an entire World of Dragons? I'm pretty flexible as far as choice of pack goes. We could also designate some areas as off limits to the power players. You know -- a sort of Bound. I am officially done with MS3D. At this point I just need time to finish making enough infinity catalysts to craft all the creative stuff and was making about 1.5 a day. So it was going to be a bit. Fearless likes to pop one every now and then but I have no objections to a new world and ultimately Don't have much time to play right now either. I looked at Bounds it looks interesting with the whole ore tier stuff. The designer said it is heavily dependant on Better with Mods which I personally spent a bit of time with and neat but not my favorite as it makes everything you are used to a bit more steps. If you want a fun little experience maybe look at trying Dark Grid. It isn't new but made me laugh a bit while I was trying it out. StoneBlock also looks interesting. Not sure how heavy it is or if it can do multiplayer. I'd be interested in playing again with you guys. As you might know, I ultimately quit Skyblock in frustration with how much hassle it was to do anything. I'd be interested in something that didn't make things extra hard, or focus on a lot of fighting. That may let me out; I know some of you are very competitive iron men and women. I briefly played vanilla, but I do like my modern conveniences. I've wound up playing Dire, solo. - real terrain. I love the vistas and with sky block mods that's missing. I really like the terrain mods in Sev tech. Some great scenery. - automation capability. I love making huge connected "factories". My favorite success in MS3D was my diamond factory using combustion. Other than that, I'd prefer a 1.12+ modpack. I suspect it's going to be difficult to find a pack that perfectly suits everyone's needs, so maybe we could try getting onto a regular pack rotation schedule (monthly, with option to extend if a given pack ends up being very popular here?) -- and try also to rotate the style and scope of packs as well, to get some variety and hopefully broaden the appeal. With that in mind, I'd propose starting off with World of Dragons for the month of October, unless anyone has a better proposal. I'll still leave M101 up, in case any of our vanilla compatriots wants to visit. I’ll probably set it up tonight. New post with the latest server information. This server is connected to #moddedminecraft on Discord. OK, cool with me. 30 days turnover is too fast for me, but I'll download a snapshot, no problem. Seems like we should make a common smeltery. I made a hole near spawn that i'll make with a wood beacon, but I'd be happy to help with a more pleasant loghouse or something. Are we starting now, or waiting until October as advertised? Let’s start. I was thinking about the logistics of a monthly play schedule, and i think it makes sense to round it off to the closest weekend to the 1st. I started hosting a new modded Minecraft server for some friends, and wanted to let you know you are welcome to join. It looks like I picked the same day as you for starting a new server. It is nothing official, but feel free to stop by. If you need to be added to the whitelist for access just post your minecraft name and I will add you. If you have previously been on one of my servers you already have access. Odd, your bucket is in the chest at the portal on the nether side. OK, going to dip in a little later today. Have we marked out areas yet? Assuming the mod allows for chunk ownership, I'm going to mark out a place today. I'll try to stay away from any obviously claimed areas. Roger is just a few meters away from spawn. Oddrune and I are sharing a mountain near the northeast corner of what’s visible on the dynmap. I know Forlorn1 joined today but I don’t know if they claimed a location yet. Arovin, I like this modpack and found a nice niche in this world. I'd like to know your plans. Your announcement suggested that you might leave it up for a while. Could that extend to, say, 3 months? I'd like to know before building yet another smelter, etc. That is the plan as long as the server stays stable. It does look like the server is down right now I will see if I can get it back up on my lunch break. Server never went down, my IP changed and the DNS did not update. Should be all set now. Arovin, how about connecting your server to discord? I found a tasty little blaze spawner, underground so the beasts can't get away. I built a ready room right next to it. Would you consider setting a warp point for it? It's at 455 73 -137. It's too far to walk a lot. Now that that I can get blaze rods, I will start a postal network with ender chests, white-white-white. If you can supply an ender pearl, I'll use it to make you each one. The three public World of Dragons servers have updated to the latest (Sept. 28) version. Let's get some crazy strong dragons up in this world! Alright, sounds like a plan. I’ll look for a good time to update WoD and let everyone know here.